​As the United States entered WWII, it was clear that defeating the Third Reich would require the destruction of the armored monsters of the Panzerwaffe. But who could take on the mighty Tigers and Panthers, just a handful could stop entire armoured formations in their tracks? The U.S. Army believed the answer lay in the creation of a new type of unit - the 601st Tank Destroyer Battalion. 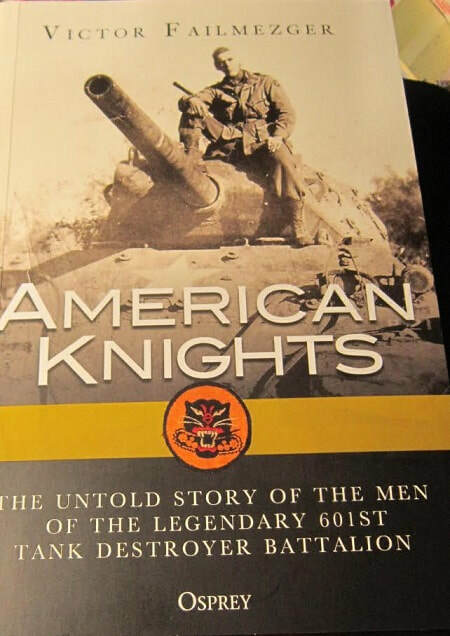 Following the experiences of nine soldiers and packed with letters, diaries, and rare photographs, "American Knights" provides a remarkable glimpse into the lives of the tank destroyer crews who were given the unenviable task of breaking down Germany's superior armored strength. Describing the formation of their unit, their unique training, and the machines they used, this book goes on to trace how the 601st fought tooth and nail, winning decoration after decoration, through North Africa, Italy, and France and the final, desperated battles in the heart of Nazi Germany. Osprey Publishing Ltd. is based in New York, NY. This book is soft bound of 448 pages in 5" x 7 3/4" page format. The cover art shows a black and white wartime photo of Lt. Welch mounted on a M-10 tank destroyer at Calvi Risorta, December 1943. The author, Victor "Tory" Failmezger is a retired U.S. Naval Officer and nephew of Lieutnant Thomas Peter Welch of the 601st Tank Destroyer Battalion, the discovery of whose wartime letters inspired this book. In the early 1970's, Commander Failmezger was stationed at NATO in Naples, Italy and lived in an apartment overlooking the Bay of Pozzuoli where the 601st conducted practice landings for both the Anzio and Souther France landings. In early 1980's he served as the Assistant Naval Atache in Rome, Italy and was a participant in the celebration marking the 40th anniversry of the liberation of Rome. A later tour found him as the Director of the U.S. Navy Science and Technology Group, Europe in Munich, Germany. He is a graduate of the U.S. Foreign Service Institute (Italian) and the Defense Language Institute (German). After retirement he worked as consultant in the private sector and for the U.S. Department of Energy and NASA. His historical works include: Roman Bronze Coins from Paganism to Christianity and Paget, Discoverer of Hades. The book contains 89 black and white small wartime photos. Some of these may need a magnifying glass to view better. There are 8 black and white maps and 5 color ones included in the book and illustrations of cloth uniform badges in color. I want to sincerely thank the folks at Osprey Publications for this review sample.